Micro Center Tech Support: What is eSATA? 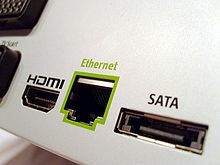 External SATA, also known as eSATA was standardized in 2004 as a means of connecting external hard drives to the SATA bus, as USB 2.0 was limited to 480Mbps and Firewire was limited to 400Mbps. 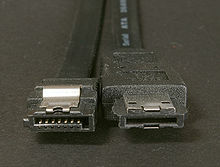 External SATA uses a different type of connector that does not have the L-Shape of a typical SATA drive and has recessed pins to prevent damage from electrostatic discharge. An external power source is required for an eSATA connection, and so most eSATA hard drives or drive enclosures provide their own source of power for the drive in use.